Start a new Audi Q7 question. I have a 2005 model Q7. It has an A/C leak (runs out of a/c after 3-4 days when charged) does not matter if it is turned on or not. No one has found it yet any ideas? 2019 Audi Q7 -Should I Buy? The high-end luxury SUV market has been saturated by Mercedes, Porsche, Lexus, and Cadillac for years now. Is there any room for a newcomer? Audi hopes so, as it unleashes its sleek Q7 in 2007. 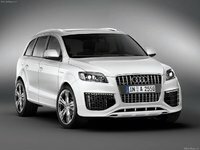 A little late to the game, perhaps, but offering the usual Audi abundance of luxury features inside, in addition to its technologically advanced quattro and variable air suspension, Audi hopes the Q7 will be attract a whole new breed of SUV owners looking for comfort as well as performance. 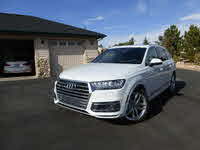 The Q7 displays Audi's trademark gaping grille, and its sloped back recalls the Avant wagon more than bulky SUV. A rooftop spoiler adds to the streamlined sportiness of the car. Inside, it is no Avant, however. With seating for seven in three rows of seats, which fold down to offer 28 different storage configurations, the Q7 is much bigger than it looks. It is currently powered by a 3.6-liter, 233 V6 or 4.2-liter,350-hp V8 engine and 6-speed Tiptronic. Standard ABS, traction control, and dual front airbags and side curtain bags for all rows maintain Audi's record for safety. Variable suspension offers four settings for ride heights, adjusting to road conditions for optimal handling and performance. The quattro is a beast in the snow, but strangely, the Audi Q7 has no low-range gear ratios for offroading capabilities. Perhaps because the focus here is on luxury. Leather seats, powerliftgate, sunroof, MMI centralized control, and plenty of storage compartments deck out the inside of the Q7. Seats are roomy and comfortable, though the rear seat is appropriate for children only. The Premium trim adds heated seats, navigation system, rearview camera, and various parking, blind spot, and imminent collision warning systems, so you really don't even have to bother trying to drive your Q7. It does it all for you. The Q7 could benefit from its late entry, because it offers a unique style and engineering that might seem refreshing next to the old-school luxury SUVs. Early reviews from owners are good, with particular praise for the light car-like handling and maneuvering. Problems with awkward gearing and lack of offroading capabilities could hurt it a bit. A V12 diesel engine, the most powerful diesel to be put in a commercial car, is set to debut in Europe next year. 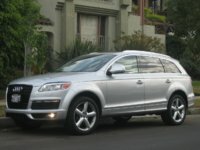 Audi is also working on a hybrid Q7 for 2008.